Mark Richt is out at Miami, announcing his retirement after a 7-6 season that started with the ‘Canes ranked in the preseason Top 10. “The University of Miami has been a part of my life for more than three decades. It shaped me as a young man and provided me with the coaching opportunity of a lifetime. My love for The U is simply great. 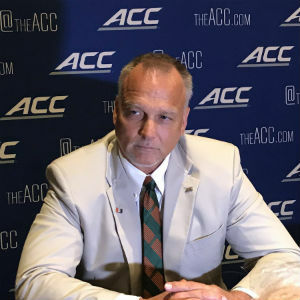 My true desire is for our football program to return to greatness, and while terribly difficult, I feel that stepping down is in the best interests of the program,” Richt said in a statement issued today. Miami was 26-13 in three seasons under Richt, who replaced Al Golden – who replaced Randy Shannon; who replaced Larry Coker, the last UM coach to win a national title, in 2001, in the midst of a four-year run that saw the Hurricanes go 46-4. Miami started the 2017 season 10-0 and was ranked second nationally before losing its final three games. The ‘Canes were blown out by LSU in their season opener, but then won five straight to get back to #15 in the national polls, before losing at Virginia, 16-13, in early October. That began a four-game losing streak, and initiated the chatter about his future. The buzz impacted the recruiting class for 2019, with several high-profile decommitments on Signing Day earlier this month dropping the Miami class to 42nd nationally, according to Rivals. Former Miami coach Butch Davis is among the names being bandied about as replacements.